Have you tried the new Mandala yarn by Lion Brand? It is in cake format and is a size 3 weight, so perfect for lighter weight items as we move into hotter months. 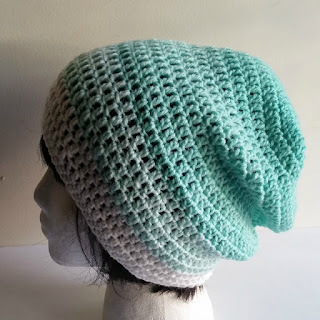 Because it has such long color transitions, I wanted a hat that showcased the colors, and I love how the design works so very well with the color changes. Unlike Caron Cakes, the color transitions are not as abrupt and are much smoother. As of now, you can get the yarn at Wal-Mart and online. As the cake is 590 yards, I can get 3 full beanies with a little yarn left over, which makes this yarn a great bargain! This project should take a few hours and is a perfect beginner beanie. As I am a loose crocheter, please pay attention to the gauge. You may need to go up or down a hook size depending on your tension. Round 6 Ch 2, dc in next 4 stitches, 2 dc in next stitch, *dc in next 5 stitches, 2 dc in next stitch* repeat from * around. Sl st in ch 2. (70 dc) Hat should be about 6’ at this point.